This wonderful and engaging story gives children and caregivers a concrete practice for dealing with anger and other difficult emotions. In Anh’s Anger, five-year-old Anh becomes enraged when his grandfather asks him to stop playing and come to the dinner table. The grandfather helps Anh fully experience all stages of anger by suggesting that he go to his room and, "sit with his anger." The story unfolds when Anh discovers what it means to sit with his anger. He comes to know his anger in the first person as his anger comes to life in full color and personality. Anh and his anger work through feelings together with humor and honesty to find a way to constructively release their thoughts and emotions and to reach resolve with Anh’s grandfather. 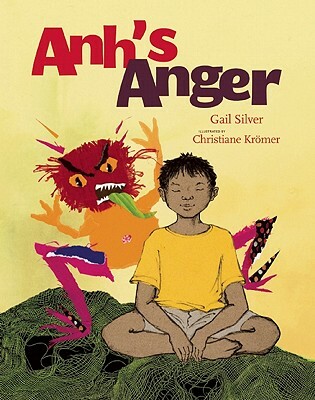 Anh’s Anger teaches children that it is okay to feel angry, and shows the technique, often used by child therapists, of externalizing the emotion. Through taking time to "sit’ with his anger, a young child is able to see his anger and talk to it and together they move through the journey of experiencing the different stages of anger until the feeling subsides and finally resolve. Anh’s Anger differs significantly from other books on anger resolution techniques in showing that the child is able to talk about what transpired and accept responsibility for hurtful things that he may have said or done. The author’s intention is to help parents understand that there is an alternative to "time out’s" as a means of helping children to express themselves when feeling angry, while providing children with a mechanism for internal dialogue during a "time out" or when "sitting" with their anger. Gail Silver is a former Child Advocate attorney and founder of Yoga Child, a Philadelphia based yoga studio, where she teaches yoga classes, writes yoga music and meditations, and develops the Yoga Child school-based yoga and mindfulness curriculum. Gail has appeared on several news shows to discuss the benefits of yoga and was the recipient of a Parents’ Choice Recommended Award in 2007 for the Yoga Child CD, A Peaceful Place Inside. She is a script consultant for the yoga segment of "The Good Night Show" on PBS Kids Sprout. Gail provides editorials on the benefits of yoga to the Expectant Mothers Guide and teaches birth preparation courses for couples through integration of the principles of mindfulness, birth education and yoga. She resides in Philadelphia with her husband and three children where she stumbles every day in her lifetime practice of mindfulness. Christiane Krömer was born in 1963 in Germany. She studied toy design at the University of Art and Design in Halle and later Graphic Design in Kassel. She moved to Brooklyn, N.Y. in the early 90s where she received a BFA in Illustration from Parsons School of Design. She lives in Brooklyn working as a freelance as illustrator with a special interest in multicultural work, in recent years with an emphasis on Asian cultures. She previously illustrated Flowergirl Butterflies (a Capitol Choices "Noteworthy Book for Children 2004), The Treehouse Children, (published by Simon & Schuster), and God the Parent's Blessings.